Serve with a glass of Vin Santo and a dollop of fresh ricotta, and drizzle both with a Tuscan honey of your choice. 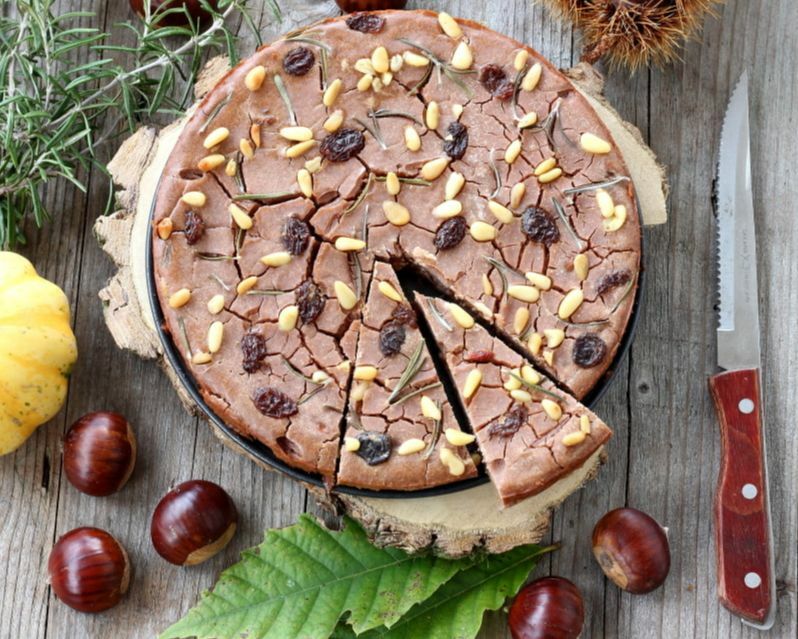 When autumn comes to Tuscany, you will be able to enjoy Castagnaccio, a torta rustica made with chestnut flour and olive oil that has ancient origins. In the 1500s, it was well known in Tuscany as cucina povera, a dish prepared by poor, peasant farmers and shepherds. Chestnuts were plentiful in the hills of the Apennines and easy to harvest, not only for its nutritious flesh but also for chestnut flour. Chestnuts (castagne) are rich in protein, calcium and vitamin A. This torta can also be called baldino, ghirighio, toppone or pattona, depending on where you are in Italy. Local variations may include other ingredients, such as rosemary, orange peel and fennel seeds. 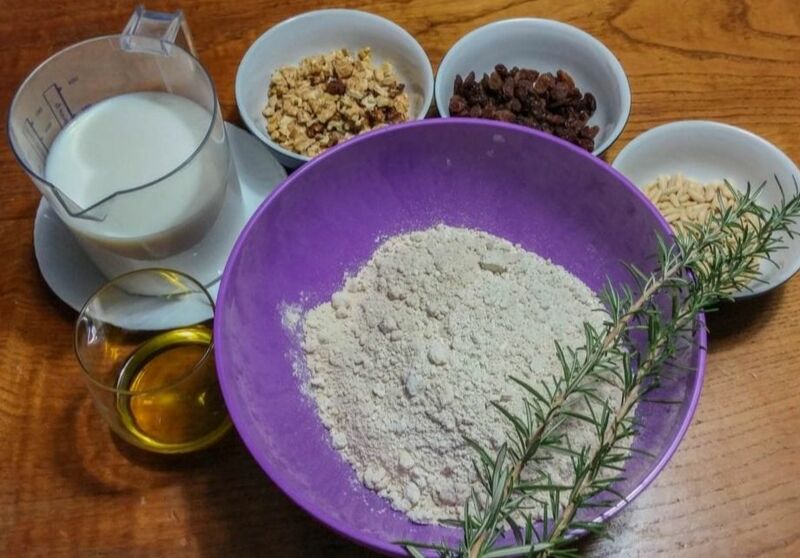 There is even one romantic legend that says when its perfumed with rosemary, Castagnaccio is a powerful love potion–making and serving it to the object of your affections will make them fall in love with you, and ask for your hand in marriage. Perhaps this is more than just a dish served during Natale, but also appropriate for Valentine’s Day! In its earliest conception, it was an easy way to make a portable food (like an energy bar) that stored well for long periods, helping sustain poor contadini during long, harsh winters.According to Ortensio Landi (1553) in his “Commentario delle più notabili et mostruose cose d’Italia e di altri luoghi“ (“Commentary on the most notable and monstrous things of Italy and of other places”), he traced its origins to a man called Pilade from Lucca. 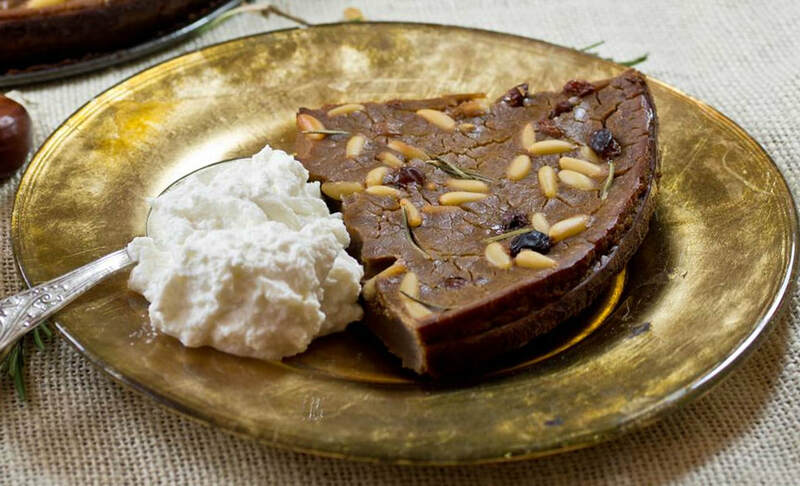 By the nineteenth century however, the addition of pignoli and dried fruits morphed this spiced cake into a dessert deserving of the Christmas season and its popularity spread to Liguria, Piedmont and Emilia Romagna, and even on the nearby French island of Corsica. Today you will find castagnaccio just about everywhere in Italy during Natale festivities. Keeping with Tuscan tastes, typically, no sugar is added because of the inherent sweetness in the chestnuts themselves and the addition of dried fruit and raisins. Castagnaccio is often served with ricotta, honey or sweet wines such as Vin Santo. Sift the chestnut flour into the bowl of a stand mixer, add the salt (and sugar, if you are using any), then mixing on low speed, gradually add water until you have a smooth, textured batter. The batter should form ribbons when it falls from a spoon. You may use either a 9″ round pan or a small flat, rimmed baking sheet (as you would brownies) to bake your castagnaccio. In either case, the pans should be well oiled with EVOO (Extra Virgin Olive Oil). Sprinkle with rosemary leaves, then drizzle with EVOO. Bake in the oven on the center rack for 30 minutes or until a nice, medium-dark brown color. You’ll know it’s getting done when the top starts to show overall cracks. Easy to whip up, and ready in 15 minutes.